The Red rooms of the New Uffizi are dedicated to the sixteenth century. Agnolo Bronzino (1503 - 1572) is the protagonist of two of them, the 64 and the 65. The Tuscan artist, who worked in the late Renaissance, is considered one of the masters of Italian Mannerism. The room 64 of the Uffizi Gallery is dedicated to the artist, and houses paintings of sacred and profane subjects, including the famous Panciatichi Holy family. The 65 room is called \"Bronzino and the Medici.\" Here some of the portraits that the artist created for the Medici family are exhibited: that of Eleonora of Toledo with her son Giovanni, the one of the Grand Duke Cosimo I, those of Giovanni de \'Medici and Bia (daughter of Cosimo I), but also that of the dwarf Morgante, famous minstrel who worked at the Grand Duke\'s court. 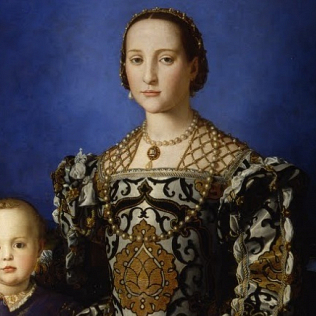 Bronzino was the official portrait painter in the court of the Medici, from about 1540. The family greatly appreciated his art. He worked at the Palazzo Vecchio, where - among the various assignments - he decorated the private chapel of the Grand Duchess. Then he realized several portraits, many still exposed in the Uffizi. He immortalized even some members of the allies of the Medici, like the Doria family. His work was also appreciated outside of Florence: he was active in Rome and in Pesaro, where he worked for the Duke of Urbino. Bronzino is one of the protagonists of the Uffizi Gallery, not only because of the number of works on display, but also because of their value and their historical and artistic significance. The artist is considered one of the great Italian Mannerists: his master was, in fact, Pontormo.